Any time is a great time to refresh your day + live your best life. Whether you are wanting to make plans for the new year or to looking make a change part way through. These end of year review questions will help you gain clarity so you can focus on your best goals. If you’re new here, welcome. I’m Jacqui, a work-at-home-schooling mum. When I talk about setting goals + projects for the year ahead, it’s not all formal + strict. This is about finding focus to do what matters most + live a life of purpose with those you love. I will admit, I enjoy making plans. As long as I can remember I’ve set myself goals for different areas of my life. Some years I hit them, others not so much. What I have learnt is that the secret to making better goals, ones that don’t leave you overwhelmed or anxious, is to look back on the year gone by. And that’s what we’re doing today. Reflection is the secret to finding focus. These end of year review questions will help you collect the information you need to connect to your best life. They will help you know what to focus on. We can’t do it all + live a life that energises us. Writing down our thoughts + plans helps us gain clarity. 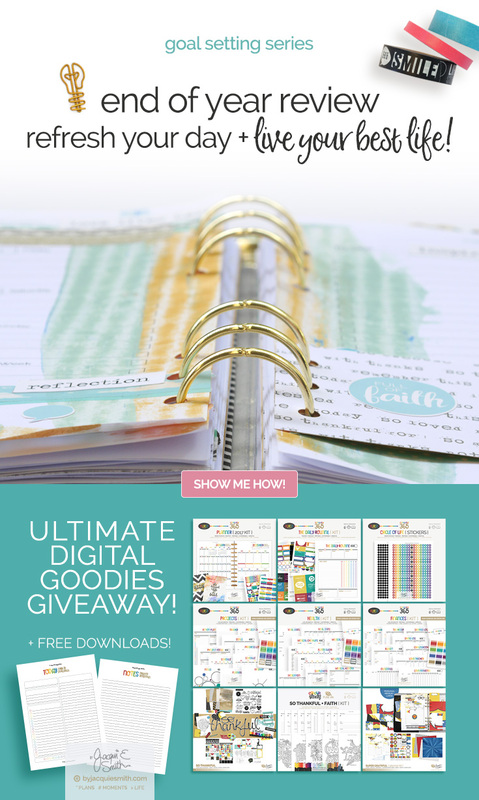 So if you’re looking for some cute planner note pages, you’re welcome to download these note pages free. Let’s dive in! First we’re going to do a little check in to see how we’re doing in the broader categories of our life. Of course you can add or delete any that don’t apply. On a line numbered from 0 to 10 mark how satisfied you are in that area of your life right now. 0 means you’re not satisfied at all, while a 10 means you’re doing awesome! Don’t get stuck on the areas where things aren’t as good as you’d like them to be. It’s only when we acknowledge where things are at that we can make the changes we desire. Take a moment + recognise the truth of your situation. These are the places where you can find new joy + areas for growth. I find the change of seasons a challenge when it comes to exercise. I’m naturally an early riser and the winter months mess with my early morning walk. The cold air affects me so I decided to switch up my daily routine to ensure I still got the important things in. It was my second year of consistent daily gratitude journalling. I grew in my approach as I changed from noting three in the morning, three in the evening + expand on one point, to picking one thing and writing at least 5 sentences about it. I enjoyed going deeper with why something was so valuable or how someone was a blessing to me. I’m more mindful of my thoughts. And that has helped to make better choices. You’re welcome to take the 5 for 2 Gratitude Challenge + see what it does for you. While we are in a good place financially, I really got our of routine with keeping the accounts up to date this year. Having a habit of putting off what isn’t exciting, although necessary, is something I’m changing in the new year. One thing that I didn’t plan for was the slow conversion from paper bills + statement to receiving them electronically. My processes need an update. I love to count my blessings. Cultivating gratitude has literally changed my life, from the inside out. It’s helped me be more aware of my thoughts + the good things that happen in my life. But I also know that not being real about where things are at stops us from getting to where we long to be. I always remember a saying of Dr Phil’s, “You can’t change what you don’t acknowledge”. This one quote helps me to face the not so good when I’d rather ignore it. It’s as we look to the past, noting the good + the not so good, that we find what we need to move forward + create a life we love to live. It’s the easiest way I’ve found to do more of what works + less of what doesn’t. So leave nothing hidden, go all in! # Tip : You may want to look to your journal, calendar, planner, photos, memory keeping projects and even your bank statements for inspiration on what filled your life for the past year. What did you make progress on? What outstanding goals, unfinished business or projects did you have? Why do you think you didn’t achieve them? How did you hold yourself back? What are you glad you spent money on? What are you glad you spent time doing? How can you better manage your energy? What were the top 3 lessons you learnt? Looking back what were your top 3 values? Are there things you should you let go of? What word would describe your past year? What I’m glad we spent money on? Our caravan. It’s become a symbol of rest, purpose + gratitude. Taking time out of our usual routine at home has kept us refreshed + energised as a family. It’s given us time to spend together, doing things we enjoy. Part of living a good life is having time for play. And our caravan has helped us learn to take time out of the doing + find rest. Creativity – I created a creative bible study for planner lovers that was also a cumulation of what I learnt about the value of gratitude + thankfulness. Change – My one word for the past year took me on an incredible journey of change. You can read more about it here. Looking back I can see that it was also preparing me for what I want to achieve. Learning – I spent time + money on learning about business + life. Learning from others is something I value greatly. I appreciate others sharing what they know + have experienced. Tony Crabbe has a great section in his book “Busy – How to Thrive in a world of Too Much” about finding your values. Defining your values helps you make choices aligned to living your best life. As you develop the habit of reflection you’ll easily see + be able to celebrate your progress. So take your time as you answer the questions that relate to you. It’s about progress not perfection! As you answer these questions you’ll gain tremendous clarity about where you are + where you want to be. The next steps will connect you with a plan to make your goals a reality, so that can live a life you love. See you soon for more planning goodness! If I could pick a fourth value for every year it would be giving. 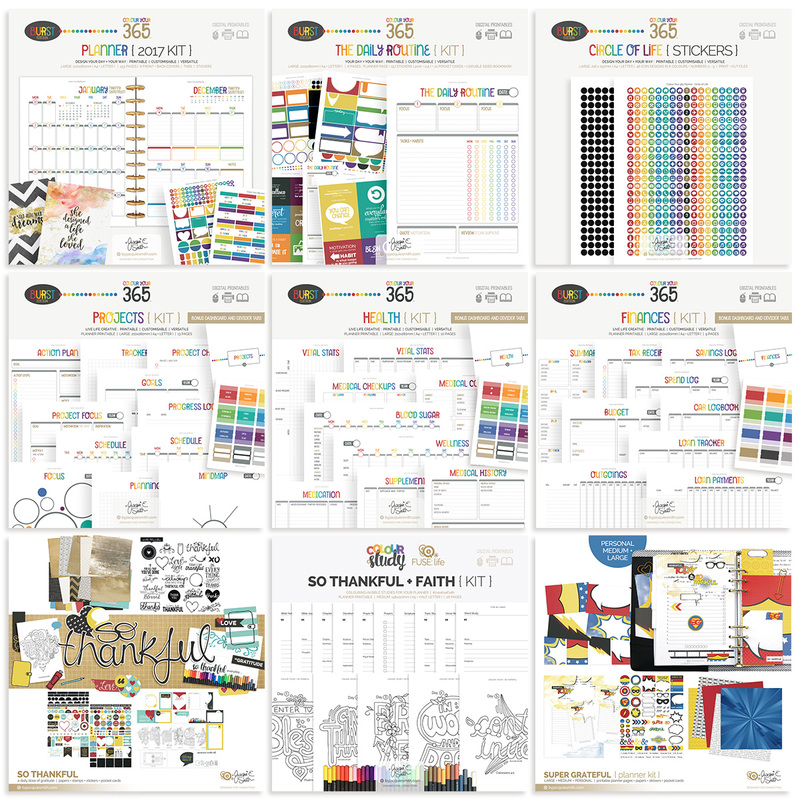 So I’ve gathered up a selection of printable + digi craft supplies from in store to help you create an awesome year ahead. BONUS: One person who comments on both their Check In + Going Deeper answers in the comments below will receive the complete bundle of digital goodies. :: Giveaway closes 31 January 2017. Share: a little or much of your answers to both the Check In + Going Deeper questions in the comments below to win the complete bundle of digital goodies listed above! Friends – 9 – I made weekly plans with a friend along with getting together with others over dinner at least once a month. Faith – 6 – My one word for the year was direction. I wanted to be better at asking God for direction in the decisions that I make, I didn’t do as well as I had hoped. Finances – 2 – I made late payments and overspent my budget multiple times. Environment – 9 – I got a bunch of things hung up on my walls and my house clean – all because I had a party for Christmas at my house – such great motivation! What did you make progress on? – I am a teacher and I purged lots of papers, activities and books that I have been collecting over the years. I gave them to my student teacher – he was happy! What are you glad you spent time doing? – I read a lot of blogs, self help ebooks and take a lot of online courses and I’ve been able to use this information not only to better my own life, but I’ve shared this information in a little blurb I write for my district’s monthly PreK newsletter. My word of the year is “LESS” and I’m thinking it’s a good fit. I’ve used your planner pages to help me keep track of things so I know when to say that I cannot do something. Thanks! Thank you for this pretty and colourful planner! I like your works so much! Thank you Zaure 🙂 You made my day! Melanie, you’re so right, time spent with family is a great way to invest our time. I’ve been making more of an effort to stop and make eye contact when someone talking to me. It’s so easy to say yes while our eyes are on our screen. It’s also a good way to add more play into your days. I really like this approach. My Mental & Physical health I think I need to take on individually- Mental I’m at about a 7 but physical I’d put a 5. I really struggle with getting (and staying) on a routine for exercise, but I’ve finally found some that I really enjoy, so it’s getting better. I am actually pretty excited to see what I can accomplish this year, versus last year- so I’ll be keeping my end of year review questions and answers tacked to the wall of my desk so I can take them out and read them every so often and take stock to see where I’m at. I might just make a binder for them so I can really compare year to year. Dee I find it so helpful too. Keeping them each year is a super easy way to do a bit of memory keeping, to recognise any patterns that may need a bit of extra special attention + of course to celebrate the successes! I’ve never been much of a resolution maker or goal setter. I have had many ideas and thoughts and wishes of things I wanted to accomplish or improve, but I never wrote them down. If I wrote them down I would have to be accountable to myself for not fulfilling anything. Now, as my life enters my golden years, I find it has become very important to me to be more proactive in my life. I want to leave a legacy behind for my children and my grandchildren. I want to leave my struggles and accomplishments, my dreams and my realizations, my hits and my misses for them to know the person I was. But more importantly I want them to know that it’s okay if you don’t succeed the first time and the real win is in trying and if you stick with it and follow the plan you set for yourself you will eventually succeed. The questions for the Check In and Going Deeper reviews have profoundly influenced my decision to be more accountable and to write things down and assess the progress I make, or the lack of progress. I think this is essential to succeeding at reaching my goals and living my dreams. I only get one chance to live my best life and there’s no time like now to start!! Fran that is such a great message to pass on to your children + grandchildren. There’s nothing secret about succeeding with your goals, just take consistent action on your plan. Wow I love the idea of the check in using a “rating system”. This was a great mindful activity and not to mention the printable is so cute! Moment of gratitude: I’m so thankful for all of the amazing opportunities brought my way in 2016, and can’t wait to see what 2017 has in store. I’m with you Khayla. 2017 is going to be awesome, simply because we’ve been mindful about what we want to spent our time on. What are your favourite memories? Watching my daughter compete on a horse she rescued. What did you make progress on? My health, family health. What outstanding goals, unfinished business or projects did you have? Holy moly……..
How did you overcome them? eat better, allow time to grieve. What drained your energy? road blocks, you can’t this x until y is done…. What word would describe your past year? massive! Denise the note about your daughter made me think of Heartland (tv show). I really want to get organized this year. Not just my calendar, but I think that is the easiest place to start. But also managing paper, clutter, the house. and of course the calendar. Vandana organising your calendar is the perfect place to start 🙂 It makes it easier to schedule those other things we want to organise! I hope this is the year I am successful at being organized. Pretty much all of my Check-Ins are at 0. I’ve become very overwhelmed and incredibly disorganized ever since my 2nd child was born. I’ve not been able to recapture the DESIRE to do better. Going a little deeper: The main thing I learned about myself is that I’m very dissatisfied with myself and my current situation in life. The only things that I’m glad I spent time doing were volunteering and getting closer to my teenage daughter. I need a major kick in the rear from God, myself, and everyone around me! Chris consider this a virtual hug. I’m glad you are celebrating the places where you invested your time well. Remember just pick one thing at a time on those things you want to work on. All the best for an amazing 2017! •	daily habits – 5 – At work I get what I need to get done, done, but fail at other things, like skipping meals….really trying to stop that bad habit. At home I procrastinate too much and don’t accomplish all I’ve set out to do and usually end up scrambling on Sunday to get everything done before I have to go back to work on Monday and start all over again. •	Family – 7 – The summers are great, my son and his family come over often to swim, grill and hang out, but not so much during the fall/winter. I do try to visit and hangout with other family members during those times. •	Friends – 0 – I have no friends; I have LOTS of cousins and other extended family members who are also my friends. I have co-workers, but we don’t socialize. I basically just work and go home, then repeat. •	finances – 7 – I’m not doing bad for myself, but could be doing better. I’m definitely better off than some I know and not as good as others. •	Play – 0 – I do not play; I am so busy paying bills so that I can retire and have no money left for fun stuff (i.e., vacations). •	Environment – 10 – I love where I live (not the neighborhood so much, but the location); it’s a beautiful place to grow up and live. We have LOTS of forest lands, 1st magnitude springs, nature trails and so much more. I live in a modest house and have been working to make it a place that I can enjoy for the rest of my days. •	What are your favourite memories? Spending time with family….they always make me laugh. •	What felt successful? Getting most of the home renovations done. •	Where was money wasted? I know, but can’t say. •	What were the top 3 lessons you learnt? Life is short; I need to give others more responsibility; and family/friends are the best!! •	faith 6. I do not go to church every Sunday, and sometimes I feel like I need to talk to him. •	mental + physical health 4. I did not exercise in 2016, and I have many pains, … I live stressed because I do not like to go out a lot, because of the money concern. •	work 8. I like my job, but I want to make more money. •	play 0. I do not play with my children, by attend the house, study the university and my work, I hardly have the time, perhaps I need help to organize me, as my eldest son tells me. •	What are your favourite memories? Celebrate for the first time the birthday of my mother with the whole family reunited, except my father who died in November 2015. •	What were the top 3 lessons you learnt? 1. Do not waste time on unimportant things like watching television. 2. Take advantage of my daughter’s childhood. 3. I work to attract more income to my home.What did you learn about yourself? Thanks to everyone who entered but even more so to everyone who joined in the goal setting exercises. I know your year is going to be all the better for the time you invested! Thank you for sharing such much needed content for us. Somehow they help me to take a path to my life. What word would describe your past year? amazing! Jen I enjoyed checking out your site! Congratulations on what you’ve done so far. I’d love to chat biz with you 🙂 And don’t be afraid to create your products, we need them!